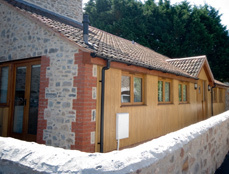 Low Barn is a newly converted Visit Britain 4 star rated barn bungalow sleeping two guests in a large twin bedroom. 1 twin bedroom in newly converted barn bungalow. Spacious open plan lounge/kitchen dining area. Contemporary styled spacious bathroom with shower. Heated indoor pool available from Easter/April 1st until November. WI-FI available in this cottage. Contemporary styled throughout the low barn will make the ideal base for a relaxing holiday. Level throughout with no steps for the less able. The lounge has double French doors opening to light patio area with garden furniture. Fitted Dining/Kitchen with fridge freezer, Washing machine, Microwave, Oven and ceramic hob. Bed Linen and kitchen linen supplied. Cots/high-chairs available - no charge. Tariff includes electricity/Gas and under floor heating during colder spells. Low Barn has parking reserved for one car. Please reserve an additional space with us for free.